We didn’t go south this weekend. We had an adventure instead. It’s really hard to leave our northern home, especially when we hear stories of storms, high temperatures and humidity, and a Biblical plague of mosquitoes in the area where we used to live. That’s not exactly motivation for going south. 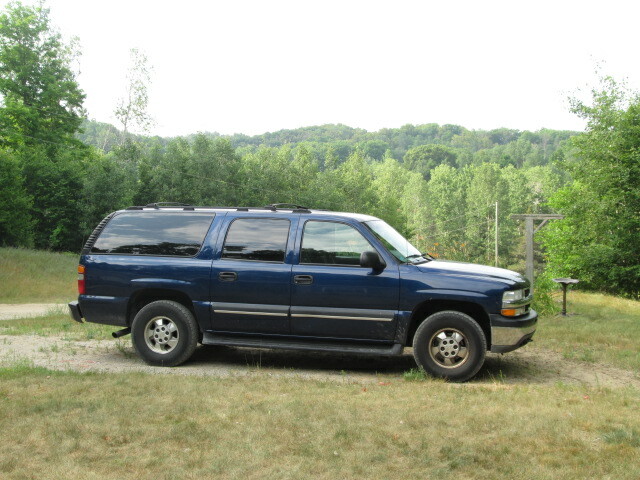 Still….we would have gone, except Friday we had to go to EJ’s nephew’s house to pick up the suburban he was selling us. With all the snow our area will get in the winter, having 4-wheel drive SUVs is a necessity. The drive to our nephew’s house was a lot longer than we anticipated so it was almost dark when we got back home and we were stiff and tired. However, the scenery we drove through was gorgeous and the fragrance of the pine trees was so heavenly that both EJ and I agreed that we both drove home (me in the Buggy and he in the Sub) like dogs sticking their noses out the car windows. Usually EJ and JJ don’t have the same days off work so it’s been hard to explore our area together. I had declared that when EJ and JJ both had a day off together, we’d go have fun. Today they both had the day off, so we had to go adventuring. I’m sort of the Planner of Fun Activities, so I decided that we would go to the Mackinac Bridge. FYI: The French pronounced Mackinac as “aw” but spelled it “ac.” The British heard it pronounced “aw” so they spelled it that way. Whichever way it is spelled, it is always pronounced “aw.” So Mackinac Bridge and Mackinaw City are both pronounced the same. Mackinac Bridge connects Michigan’s two peninsulas. 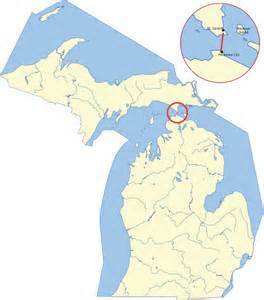 Just in case you don’t know, Michigan is actually two peninsulas: The Lower Peninsula and the Upper Peninsula–or the UP, pronounced yoo-pee. The Mackinac Bridge spans the Straits of Mackinac and connects the two peninsulas. When it was first opened in 1957, the 26,372-foot bridge was the longest suspension bridge in the world. The Mackinac Bridge website says it is currently the fifth longest suspension bridge in the world and the longest suspension bridge between anchorages in the Western hemisphere. We took the scenic route along the coast to the bridge, and we exclaimed with excitement whenever we caught a glimpse of Lake Michigan, one of the five Great Lakes. I took pictures as we drove along, of course. When we saw a breathtaking view of sailboats, EJ pulled into a parking lot so I wouldn’t miss the shot. The boats were all grouped together so we kind of wondered if they were getting ready to race or something. We loved crossing the Mackinac Bridge! Please overlook the shakiness of the video. It was hard to hold the camera steady. After we crossed the bridge into the UP, we stopped at a pasty shop for an authentic Michigan pasty (pass-tee), which is a meat pie that was introduced in the United States by Cornish miners who immigrated in the 1800’s hoping to earn a good living in newly developing mines. We took our pasties to a scenic park to eat. After we ate, we drove to Castle Rock, which is a geological limestone stack and tourist attraction located 3 miles north of St. Ignace. According to its website, it is considered to be one of the oldest lookout points near the city of St. Ignace, and was known as “Pontiac’s Lookout” by the Ojibwa Tribe. Clarence Eby opened Castle Rock for tourists in 1929, and it has remained a popular tourist destination ever since. Castle Rock rises an astonishing 195 feet above water level and about 183 feet above I-75. The summit of Castle Rock offers a scenic and inspiring view for up to 20 miles, featuring Mackinac Island, Lake Huron, downtown St. Ignace, and wildlife habitat. The lookout point is equipped with viewing binoculars for a truly spectacular view of the area. It cost only $1 to climb Castle Rock. Once we had paid the fee, we were told to follow the giant footprints through the gift shop, through the door, and to the stairs leading up to the lookout. I had been so focused on my anticipation of the view at the top, that I never really considered how many very steep steps we had to climb to reach it. It was TIRING, and we huffed and puffed up the steps. We sat down at the bench located halfway up the steps in order to gain strength for the rest of the climb. But, oh, my goodness! The view at the top was breathtaking! After the climb, we bought hats–we felt we deserved them after successfully reaching the top of Castle Rock–and the store staff gave us stickers celebrating our accomplishment. Driving to Castle Rock, which can be seen in the distance. Following the footprints through the gift shop to the stairs. Afterwards we had our picture taken near Paul Bunyan and Babe the Blue Ox. We all bought hats. This is mine. This is the view when we finally reached the top! 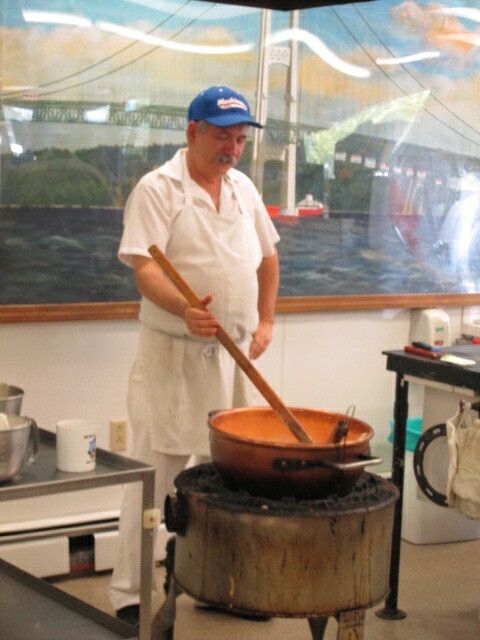 The Owner of the Fort Fudge Shop making fudge. Although there are many, many things we’d like to see in Michigan’s UP, we couldn’t see them all today. So we drove back across the Mackinac Bridge. We decided to visit Fort Michilimackinac, which was an 18th-century French, and later British, fort and trading post at the Straits of Mackinac, which connected Lake Huron and Lake Michigan. However, when we had parked and stepped out of the car, our legs felt weak and shaky after the Castle Rock climb, so we decided to go instead to a nearby fudge shop called Fort Fudge. We were really glad we did. The fudge was made behind the counter so customers could watch. The owner was very friendly and told us stories about the area. When I told him I was videotaping him making the fudge, he invited me to come behind the counter to get a better view. EJ let us each choose a fudge (he chose chocolate cherry fudge, I chose peanut butter vanilla, and JJ chose mint chocolate). Because we bought three, we got a fourth box of fudge free. We told JJ that we are now officially “Fudgies,” which is what people are called who come to Northern Michigan to buy fudge. After we left the shop, we happily drove home. We had a great day. I have always thought Michigan was the most incredibly beautiful state, especially in the North. Sometimes we can’t believe we are living here and not merely vacationing. We can’t wait for our next adventure. Maybe next weekend we will head south.